The term papilledema and disc edema look alike which means swelling of the optic nerve. It is a condition which is characterised by the increase in pressure in or around the brain that causes the part of the optic nerve inside the eye to swell. It is characterised by the swelling of the optic disc (the place where the nerve that goes to the brain and connects inside the eye). This swelling is a reaction to a build up of the pressure in or around the brain. Very often, this condition is a warning sign of a serious medical condition that needs attention. Sometimes, the swelling and pressure cannot be traced to a specific problem. In these cases, there are other ways to ease the swelling. This condition is 20 times more likely among obese women in the child bearing years. 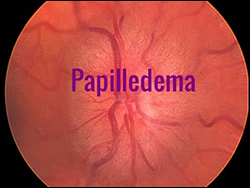 WHAT ARE THE CAUSES OF PAPILLEDEMA? Encephalitis i.e. inflammation of the brain or its tissue coverings. Pus collecting from a brain infection. Problem in flow or amount of fluid that runs through the brain and spinal fluid. WHAT ARE THE SYMPTOMS OF PAPILLEDEMA? It may be present without affecting vision. There are no symptoms in the early stages. Doctors generally discover this condition when they see optic disc swelling during a routine eye examination. As this condition progresses, person may likely to have vision problems in both eyes. Person may lose vision for a few seconds at a time. Doctors usually use a tool known as opthalmoscope to look inside the back of the eyes. MRI can provide more details and possibly shows the cause of pressure in the brain. Modern treatment includes the prescription of antibiotics for a brain infection or surgery may be required to drain an abscess or remove a tumor or medicines to remove blood clot. According to Ayurveda, the term shotha is used to describe swelling which may be due to an inflammatory process in any part of the body. Swelling occurring in any part of the body may occur as either Swatantra Vyadhi (primary) or Prantantra (secondary) condition. Papilledema can be considered as Drishti Nadi Shotha which may be primary or secondary. According to Ayurveda, it is a type of Kapha-Pittaja Shotha and should be treated on the line of Shotha Chikitsa. Angel Eye Vitale is an herbal supplement by Planet Ayurveda that gives wonderful results for the patients suffering from eye disorders. Main ingredients of this formulation include Vitamin A, Vitamin C, beta-carotene, Vitamin E, Zinc, Copper, Lutein, Zeaxanthin, Astaxanthin and bilberry. Thus, this supplement of Planet Ayurveda is full of nutrition as well as anti-oxidants. Bilberry Capsules of Planet Ayurveda are prepared from Vaccinium myrtillus herb. This herb is a rich source of anthocynosides and is a rich source of Vitamin A, C, E, K, magnesium, zinc and iron. These capsules are very effective in eye related defects such as myopia, night blindness, diabetic retinopathy, glaucoma and other eye related disorders. The main ingredient of Amalaki Rasayan is Emblica officinalis. It is considered as an excellent remedy for eye disorders. It is an Ayurvedic product used for rejuvenation. It is used as a dietary supplement in various chronic diseases. It is considered as a strong natural anti-oxidant and it is very useful in combating inflammation related to eyes. Dose: 1 teaspoon twice daily. Kaishor Guggul is one of the famous Ayurvedic medicine having multiple health benefits. It contains natural blood purifying herbs like Triphala and Giloy. It is indicated in pain and inflammation. Kaishor Guggul mainly works by preventing further accumulation of pitta dosha by regulating metabolism and assisting in the proper elimination of toxins. Brahmi Capsules are prepared by the herb Bacopa monnieri. It is one of the oldest and most powerful brain tonic used in Ayurvedic system since ancient times. The active components present in Brahmi like bacosides acts wonderfully on the brain health. It shows miraculous results against the rapid degeneration of brain cells. This herb is also anti-oxidant in nature and protects the body from the damage caused due to free radicals. Ankur Eye Drops have anti-inflammatory properties that is effective in soothing inflammation. These eye drops help in healing the wounds quickly and also have a role in protecting the ophthalmic tissue from local oxidative damage and its cooling effect alleviates eye irritation. These drops are highly effective in inflammation eye disorders, dry eyes and various other eye disorders. It contains various herbal ingredients such as honey which acts as an anti-inflammatory agent which soothes the eyes and heals wounds. It contains basic principles of different herbs which have been conventionally used in Ayurvedic system of medicine.